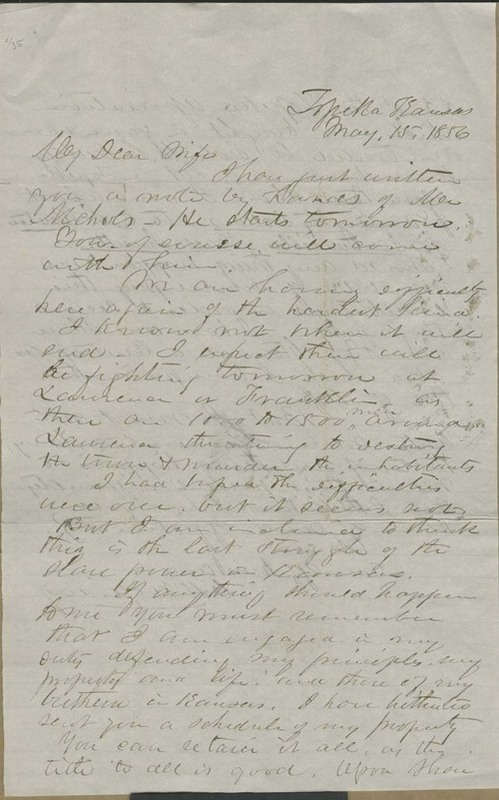 Expecting a clash between free state and proslavery forces at Lawrence, Kansas Territory, Cyrus K. Holliday wrote last instructions to his wife, Mary Holliday, in Meadville, Pennsylvania. Despite the threat of violence, Mary was to travel to Topeka, K. T. with Mr. Nichols, where Cyrus had traded shares to Milton C. Dickey for a house. He told her of a debt to E. S. Dexter of Massachusetts and a share in Centropolis, established that year in Franklin County. While emphasizing business matters, Cyrus did not neglect to express his love.